Our Midnight Lightning Ocellaris Clownfish is the results of breeding our Midnight Clownfish with our Phantom Clownfish. 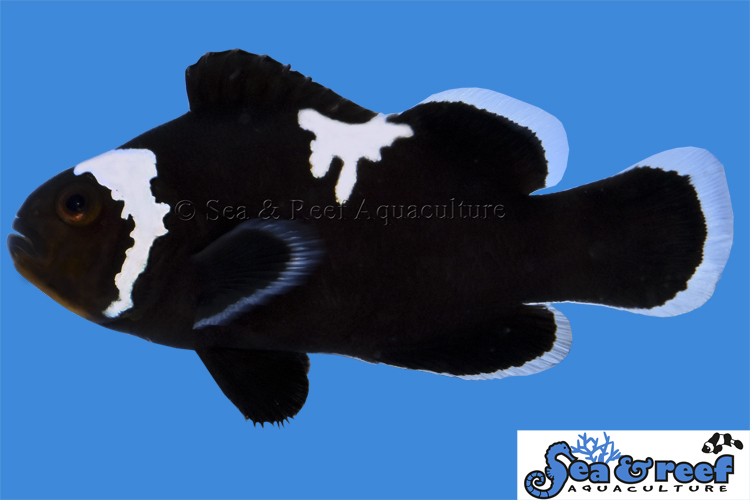 The result is a mostly black clownfish with lightning bolt pattern between their 1st and 2'nd dorsal fin. Most Midnight Lightning Clownfish have a white head stripe with a jagged snowflake-like pattern. Some fish have no third stripe and some fish have another lightning bolt marking in place of a third stripe. Belonging to the Ocellaris species it is a robust and peaceful fish that will do well in most community tanks. Midnight Lightning Clownfish are brownish when they are very early juvenile and then develop their deep black coloration as they grow and mature. Some of our fish are jet black around 1 ¾”. The brown markings around their face are the last part to turn black. They are just gorgeous and excellent reef fish. The temperament and captive care requirements of the Midnight Lightning Clownfish is very similar to that of the regular Ocellaris clownfish. It is a relatively peaceful and hardy clownfish. They thrive in saltwater aquariums with or without an anemone present. Midnight Lightning Clownfish will readily accept a wide variety of host anemones and many hobbyists keep it with the popular and hardy Bubble Tip Anemone (Entacmaea quadricolor). As a reference the natural host anemones of the regular ocellaris clownfish are Magnificent Sea Anemone (Heteractis magnifica), Sebae Anemone (Heteractis crispa), and Giant Carpet Anemone (Stichodactyla gigantea).